Blackjack, also known as Pontoon or 21, is known for making an appearances in Bond films, attracting MIT maths geniuses and also as the name of a rather tasty retro sweet. 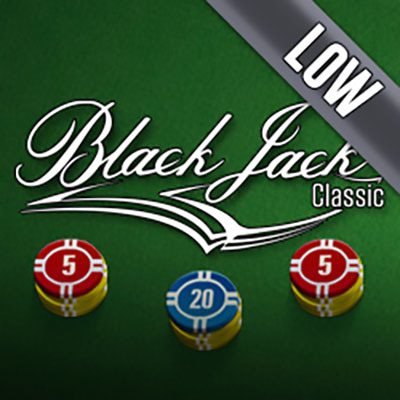 Blackjack Classic Low Limit from NetEnt is a great introduction to one of the most popular table games in the world for players who want to get to grips with the rules and strategies without betting big. Players can stake between £0.10 and £5 per bet until they fancy raising their stakes with the medium or high limit version. Renowned for their dazzling portfolio of more than 200 games, NetEnt are a Swedish developer with an exceptional reputation both within and outside the gaming industry. During the past 20 years NetEnt have been instrumental in innovating many aspects of online gaming including video slots, live dealer games and classic table games such as Baccarat, several versions of poker and roulette. They also put players first by creating different versions of each table game to suit first-time gamers as well as high rollers. Visually, Blackjack Classic Low Limit is a smooth take on a table classic. The rules are printed on the green cloth while bet-boxes are clearly marked for ease of play. This Low Limit version allows players to stake between £0.10 - £5 which will appeal to entry-level players or whales who want to come up for some air. The game begins by the dealer dealing himself and the player two cards each. If either player is lucky enough to be holding Blackjack (an ace paired with a 10, J, Q or K) then they win that hand. If neither player has Blackjack then both players can choose to stick or twist to get as close to 21 as possible without going bust. The dealer is required to play according to certain standard rules. For example, he will always stick on a ‘hard’ 17 (a 17 without an ace) and twist on a ‘soft’ 17 (a 17 with an ace as this can count as a 10 or a 1). Beginners might not be familiar with this aspect of the game which enables players to hedge their bets if the dealer’s upturned card is an ace. The reasoning for this is that if the dealer has an ace, the player knows that they have a good chance of making Blackjack with the next card. By taking insurance (which pays out at two to one), the player can cut their losses rather than continue playing. The appeal of Blackjack for many players lies in its unusually high return. This is also true of Blackjack Classic Low Limit from NetEnt as players can enjoy the highest RTP of any NetEnt games at a staggering 99.83%. The beauty of this version of the game is that beginners can get to grips with betting strategies while staking amounts that they are comfortable with before moving on to higher stake games.